No kill deer hunt founder Todd Dunn in front of part of the display set up Saturday at Rareden’s White Tail Deer Festival. The first female to take part in the event, Lynzee Nickles shows off the mounted deer she shot during last year’s no kill hunt. Out on his farm in West Portsmouth, Todd Dunn is in the business of helping hunters of all types, one way or another. To earn a living, Dunn collects liquid deer waste for use by hunters. Obviously, he raises deer on his farm. Once a year, the male deer need to be tranquilized and their antlers removed. The reason is, male deer, or bucks, quickly can become territorial. Removing the antlers cuts down on fighting and helps keep the animals safe. As tranquilizing the deer must happen anyway, somehow Dunn came up with the idea of a “no kill” deer hunt. 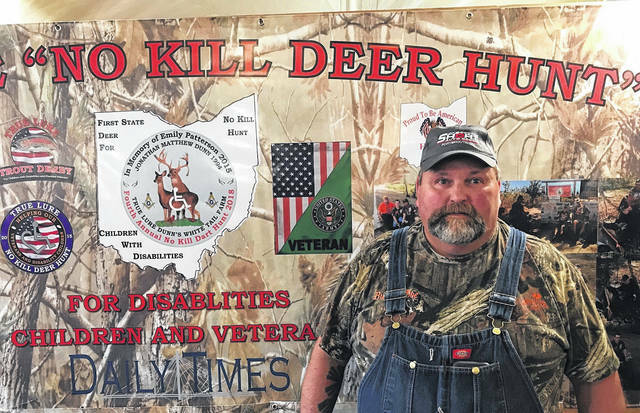 The hunts are aimed at physically and mentally challenged children along with disabled military veterans. They also are dedicated to the memory of Emily Patterson, Dunn’s would-be daughter-in-law, who died in an accident in 2015. Dunn and his wife are raising Patterson’s young son while their son serves in the military overseas. The True Lure No Kill Deer Hunt is now entering its fourth year. “It’s the best, I love it,” said Lynzee Nickles, 17, who has taken part in three hunts. She will be working as a guide for this year’s event. “She’s one of our old pros,” Dunn remarks. Just like any other hunter, the no kill hunters wait in blinds for their prey to appear. Unlike regular hunters, they use tranquilizer guns and shoot darts at the deer. Suffering from a genetic disorder, Lynzee is unable to fire a weapon herself. Dad Sam Nickles helps her hold the gun, takes her out for target practice and so on. A hunter himself, Sam Nickles remarks that he never thought he would see his daughter out in the field hunting. He further tells a story about Lynzee initially being very fearful about killing a deer. After her first hunt, she came back the next day and was able to see the animal she shot up and walking around. “She was so relieved,” dad said. The no kill aspect of the hunts is extremely important to the veterans who take part, said Sgt. Rick Bell, a disabled Army veteran who had part of a building fall on him during Desert Storm. Though he uses a wheelchair, Bell has been a guide for hunts and intends to do so again. “We get a lot of kids in wheelchairs,” notes Dunn. One of those is 12-year-old Adam Lynch. What does he like about the hunts? “Everything,” he replies, though he stays somewhat quiet otherwise. “There’s not a lot handicapped kids can do in this county,” says mom Deidra Lynch, who like her son is a big fan of Dunn’s efforts. “He was very picky about the animal he wanted to shoot,” said dad David Lynch, who added his son allowed a few deer to walk on by as he waited for the target he wanted. Adam, by the way, holds the record for the biggest buck shot so far, taking down (temporarily) an animal with antlers reaching 151-plus inches. Adam and all the hunt participants receive the antlers from the deer they shot. The antlers are mounted by a local taxidermist on pelts gathered and donated by more traditional hunters. Even does shot during the no-kill hunt are prepared in a similar way. 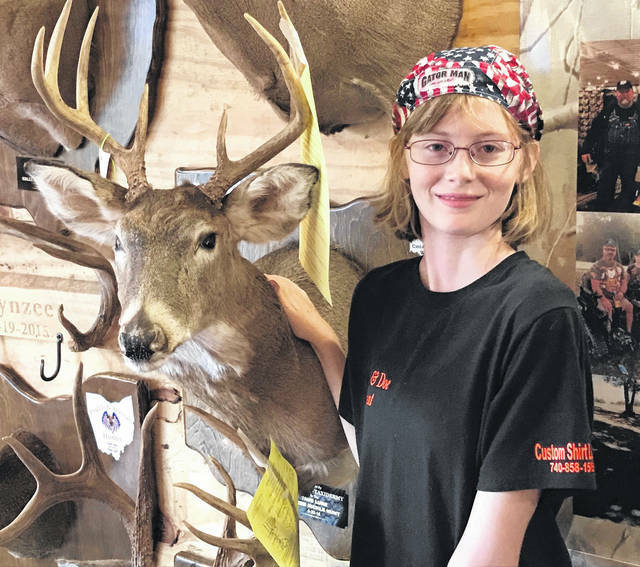 Dunn, Bell and some of the hunters were at the Rarden White Tail Deer Festival on Saturday to pick up their mounted deer heads along with various trophies Dunn awards. Dunn did say the wet weather kept some hunters and their families away. “You really don’t understand how much this can mean to a kid, until you see them spot their first deer and their eyes just grow giant and their heart starts pounding,” Dunn wrote in a pamphlet promoting the no-kill deer hunt. This year’s hunt will happen probably in the next week or so, as soon as Dunn’s deer loose the “velvet” off their antlers, signaling they are ready to be hunted and safely have their antlers removed. “Being able to be part of this, it just doesn’t get any better than this,” Dunn has said. Holding the no-kill hunts is not inexpensive. Sam Nickles noted tranquilizer shots cost $100 each. Dunn accepts sponsors, one of which is the Daily Times. He has set up a formal 501(c)3 charity, meaning donations are tax deductible. Anyone who would like to support his efforts or would like to have a child participate in a hunt – or if you happen to be a vet who might want to take part – call (740) 858-0436.